A bold statement, but these cookies deserve it. They are made with 100% whole food ingredients– no flour, no added oil, and no added sugar. And believe it or not, they still taste great! These healthy cookies have a soft and tender texture that reminds me of my childhood favorite “soft batch” cookies. If you prefer a firmer cookie, simply store and serve them directly from the fridge or freezer. Preheat the oven to 350F and line a baking sheet with parchment paper or a silpat. In the bowl of a food processor fitted with an “S” blade, process the dates and walnuts together until a crumbly texture is formed. 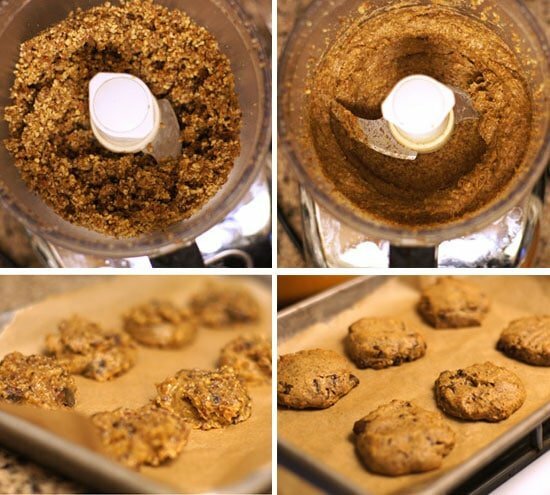 Add in the salt, baking soda, vanilla, flax egg (see how to make a flax egg here), and vinegar, and process again until the batter is relatively smooth, a little stickier than traditional cookie dough. Spoon the batter onto a lined baking sheet, and use your hands to gently flatten the cookie dough. (Tip: Wet your hands with water to prevent sticking!) Bake at 350F for 12 minutes, or until the edges are slightly golden. Allow to cool on the pan for 10 minutes, then transfer the cookies to a wire rack to cool completely. Serve immediately, and store the leftovers in a sealed container in the fridge or freezer for best shelf life. These cookies should last a week in the fridge, and a month or more in the freezer. 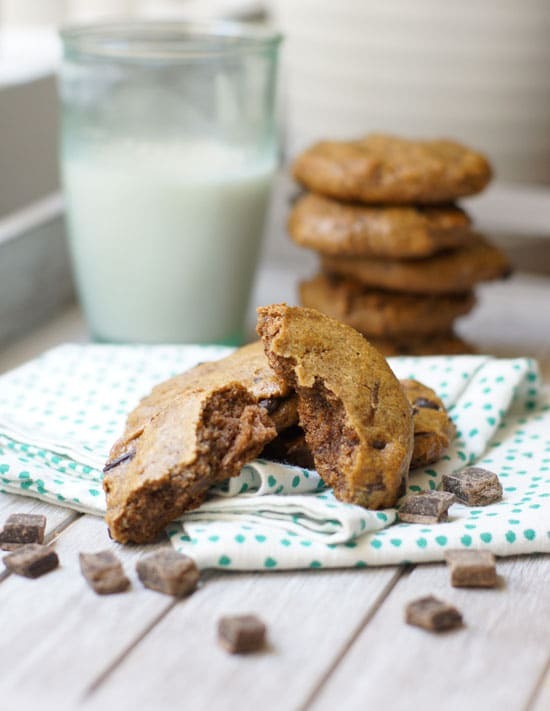 Cookies made with 100% whole food ingredients for a healthy treat anytime. Preheat the oven to 350F and line a baking sheet with parchment paper or a silpat. In the bowl of a food processor fitted with an "S" blade, process the dates and walnuts together until a crumbly texture is formed. Add in the salt, baking soda, vanilla, flax egg, and vinegar, and process again until the batter is relatively smooth. Add in the chocolate chips and briefly pulse, just to combine. I love the buttery flavor of these cookies when made with walnuts, but I have a feeling that pecans or almonds would work well, too. If you don’t have access to dates, raisins can be substituted in most cases, but the flavor will be slightly different. If you don’t want to use a flax egg, one chicken egg can be used instead. It was so yummy and healthy. Great recipe – will make again & again!! will it affect the texture too much to omit the dates and sweeten with stevia? wow, simply amazing, my whole family loved them THANK YOU!! I must post a second time. Theses cookies are even better today! Thanks again. I made these cookies last night and just loved them! Thanks for the wonderful recipe. I’m doing my AIP right now. I hope nuts will be a food that I can add back soon. This will be first on my list! They look amazing! Just wanted to say these are delish straight out of the freezer! Thank you for this great recipe. I’ve made it twice and it’s a new favorite. I added a touch of rum flavor and it imparted a wonderful taste. This is a very positive website with healthy and helpful recommendations. I come on Megan’s website to get awesome recipes. I was trying to answer your question helpfully. I’m 33, vegan, exercise and live a clean lifestyle. This includes not drinking alcohol. Please take your negativity to another website, we don’t want it here. I just made these cookies and they are awesome!! Thanks for the recipe, they will be a regular in my home. Mmm, I’ll have to try these. I just happen to have a glut of dates AND walnuts in the house this very moment; AND a potluck tonight. Thanks Detoxinista! You’re the best! i love that they are flourless. they look great! It’s not added sugar or sweetener. It’s a fruit, like adding a banana. Natural sweetness, not like adding brown sugar, etc. it’s truly amazing and tasty! Thanks so much for posting this recipe! These cookies sound delicious. I have been using raw walnuts a lot lately so this is perfect! Instead of raw walnut halves, I used one (generous) cup of dried almond pulp (homemade almond milk leftover) and blended the dates with about 1/3 cup of (homemade) almond milk before adding the rest of the ingredients: beyond delicious AND healthy! Thank you again, Megan, for being such an inspiration! Thank you so much; I try to use up my almond pulp and here’s another idea. My husband just loves cookies, so this is amazing. I am a bit obsessed with walnuts at the moment so these look amazing – never used flax seed instead of egg so will need to give this a whirl! Thank you so much! These look phenomenal and I think, will have the flavor of a cookie I used to make with my Mom. I can’t wait to try this recipe. It will be the first cookie I made once the heat dies back a little. You made my day! I haven’t tried a nut-free version yet, but I’ll let you know if I do! Hopefully some other commenters will post their results, too. These are so delicious! Thank you for this amazing recipe. My boyfriend gets a little bit of an itchy throat from walnuts. Do you think pecans or almonds would give the same consistent consistency? I think pecans would definitely have the same consistency as the walnuts. You can add 1 to 2 tablespoons of brewers yeast per 12 cookies, without affecting the flavor too much. (There is a slightly hint of “beer” taste to me!) Make sure you buy de-bittered brewers yeast, because the regular version tastes TERRIBLE!!!!! Hmmm I’m salivating at my laptop screen. I cannot wait til the weekend to try these babies. Hmm… I have no idea! It might make the batter too wet, but I wouldn’t know without trying it myself. Please let us know if you have any success! Yes these are great with soaked/sprouted nuts! I made them with a mix of walnuts, sunflower seeds, and cashews I soaked for 18 hours and then dried in the oven at 170F. I also added cinnamon, nutmeg, and a tiny hint of anise; I also used a real egg. My batter was pretty coarse and I enjoyed them immensely. Would these work with cacao nibs instead of chocolate chips? What’s your favorite healthy dessert? Forgot to answer your question. I have always loved any desserts but have tried to go to more healthier desserts. Your recipes really satisfy my sweet tooth (& hubby’s) & I don’t feel guilty eating them either since you use such quality ingredients. So my answer is your desserts!! I like variety – sometimes cookies, sometimes ice cream, sometimes cakes or breads like zucchini, etc. – mainly texture thing. Always enjoy something “crunchy”. Hope that helps. I know, I hate the wait on the cookbook!! I did just see the cover photo last week, so it’s making progress… however slow it may be. Hope you enjoy the cookies!! Can I use an egg instead of “chia egg or flax egg” in this recipe? I don’t have an allergy to eggs and I’m not a vegan. Looks great! Any suggestion for a nut-free option? Making these tonight! I was looking for something sweet for my hubby who has an egg allergy…perfect. Yum! I added the coconut to these and next I’ll try adding hemp hearts in with the nuts as well. Im thinking they would make a fantastic post workout protein cookie without all the chemical fillers! And my favorite healthy dessert? Anything off your blog. They’re all amazing! These cookies are fantastic! I used roasted unsalted cashew pieces instead of walnuts because that is what I had and the results were so good! 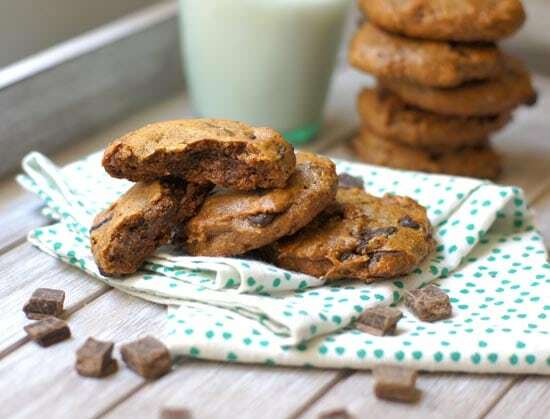 The chocolate chips add just the right amount of indulgence. They really are a healthy snack that you can feel good about enjoying any time. In fact, I want to have these cookies on hand at all times! Thanks so much for a great healthy recipe! How impressive! Thanks so much for sharing. Wouldn’t it be awesome if people started baking like this more and sold treats like this instead of the traditional sugar loaded processed ones! Then I could buy!!! Especially at school fundraisers and bake sales….I buy and toss….and feel guilty about the toss, but if I could buy a cookie like this it would be like winning the lotto! Twice even. And I don’t even play the lotto. It would be AWESOME! My sister does the same thing: buys and tosses. But how about if we just refuse to buy? And then they would have to think of other things to sell instead of sugar and plastic and they might take other suggestions if we stopped buying the same old fundraising. These companies are just using children to sell products anyway, donating to the school, but still making a profit. I think we will always be pulled along by the mainstream way of thinking about nutrition, fundraising, etc, unless we stop and make a stand. And also, I made these cookies. They are GREAT and will be a regular treat recipe from now on. Why not just buy and donate? I´m sure there are people who would love some free baked goods! Even if they are sugar processed, drop at a shelter, donate to the fire department, find some hungry teenage boys, I’m sure you if you looked you could find someone instead of wasting food. It is great that you want to contribute to the fundraiser. What about skipping the buying and tossing and donate the money directly. 100 % goes to the organization you are supporting. It is a shame how these companies use our kids and the guilt trick to sell low quality products that we wouldn’t buy otherwise. These are awesome! Thank you! All the optional ad-ins are great, too! 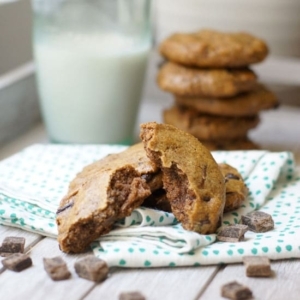 I love that these cookies are so versatile, & I look forward to making many versions of them!! Btw, do you have any tips on chopping raisins? (Of course, you might add them whole.) I like raisins in bits in baked goods. But I’m concerned about using a knife to cut them even with the tips I’ve seen of freezing them &/or adding oil to the knife. Since they’re so small, an accident seems so easy. Would chopping them in a food processor work, or do you know of anything better? Thank you for any thoughts! Also, thank you so much for your blog!! try freezing them (raisins) then popping them in a processor and pulse. i am allergic to nuts, is there a way to sub the them in the recipe? Do you have nutrition I forma to. For these cookies? I am diabetic. I don’t provide nutrition info, but you can calculate any numbers you need using a free website like Fitday.com or MyFitnessPal.com. Thanks for the recipe, Megan. Can I use one egg instead of the ‘flax egg’ in this recipe? Yes, that’s mentioned in the recipe notes. That’s easy – chocolate avocado mousse! Yum… I can’t wait to give these a try! I love adding dates to baked goods to sweeten things up and they have the best flavor!